Would you like to learn about contact center best practices, original research and new resources from Calabrio? Yes, I would like to receive updates. No thanks, I don't want to receive notifications at this time. Automation and digital transformation efforts within the contact center space are beginning to align with the future needs of customer expectations. As new best practices come to light - what can your contact center be doing to not fall behind? 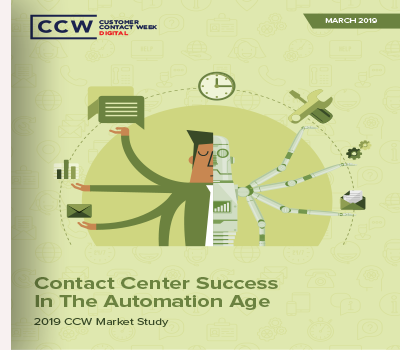 In the 2019 CCW Market Study: Contact Center Success In The Automation Age, CCW Digital surveyed customer experience, contact center, marketing, customer care, IT, and operations professionals about what they are doing to achieve their contact center goals—and the challenges they face along the way. Calabrio is revolutionizing the way enterprises engage their customers with Calabrio ONE, a unified workforce optimization (WFO) suite—including call recording, quality management, workforce management, voice-of-the-customer analytics, and advanced reporting—that records, captures and analyzes customer interactions to provide a single view of the customer, and improve the overall agent and customer experience.